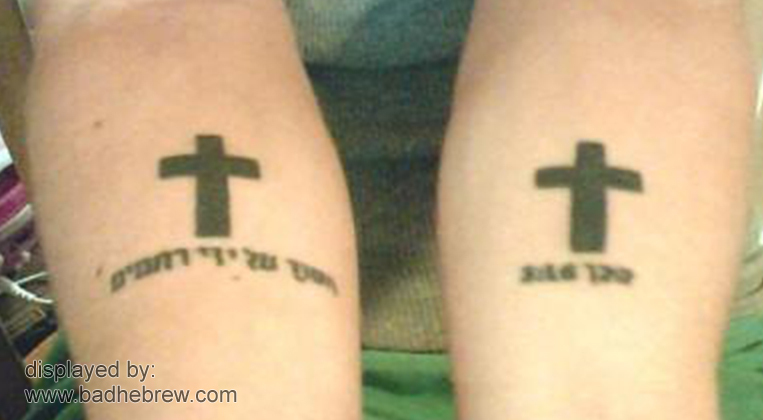 Bad Hebrew Tattoos: Who Saved You? And Where? Anonymous (with the shameless link in your comment) - too many people have a hard time realizing that Hebrew is something that requires translation, let alone professional translation. It's not easy to convince someone to actually pay for a translation before paying for the ink job. how would i seperate "Saved by Grace" in hebrew, if i where getting it tattooed on my wrists. Why not, instead, out of respect for the temple of the Ruach HaKodesh (Holy Spirit) don't degrade your body with such trash? Hesed is not the right translation for grace. Hesed means lovingkindness. Chen (Chet-final nun) means grace. Also, I am not sure how you are trying to render "saved," but no-sei-a' as you currently have it means "being saved" (present participle). Na-su-a' (nun sin vav ayin) would be "saved" -- like past tense. If you are a Christian trying to tattoo yourself in Hebrew, which in my mind is really questionable, you should probably go to a reputable Hebrew translation of the New Testament to see how they have rendered the verse in question. @Anonymous who posted the last two comments: You're wrong on both counts. Please consult a Hebrew dictionary before commenting next time. @ Reut from google translate...haha.